Gently wash your vehicle with genuine boar’s hair. I make it a point to try out each new product that comes through Autogeek’s doors. I’m usually satisfied with their performance, maybe even impressed, but rarely am I genuinely wowed. But that was definitely the case with this Montana Original Boar’s Hair Wash Brush. 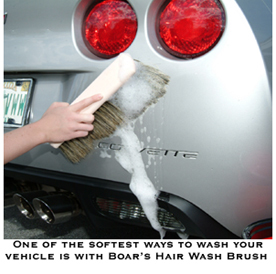 I’ve heard car collectors speak of using a boar’s hair brush to wash their vehicles, but I had never tried it myself. Could it really be that different from using a sponge or mitt? The answer is a resounding YES! The Montana Boar’s Hair Wash Brush is unbelievable: it actually feels better to wash with it. The hairs are softer than I had imagined and they glide over the paint like silk. This brush is a bit of a luxury but its well worth it! I did a little research and it turns out that a Boar’s Hair Wash Brush is one of the safest ways to wash your vehicle. Boar’s hair is surprisingly soft and its durability is unmatched by any other natural hair. It’s been used to make hair brushes for people for years. In fact, baby brushes are often made of boar’s hair. If a boar’s hair brush is soft enough for an infant’s head; you can be sure its soft enough for your baby! Our Boar’s Hair Wash Brush is packed with four hundred hairs per bundle. Boar’s hair is naturally feathered at the ends but our bristles are flagged (split) one more time before being affixed to the heavy duty plastic handle. The tight bundles of hair ensure that the bristles remain sturdy as they gently whisk away dirt and grime from your vehicle. The brush may leave a few hairs here and there on your vehicle; don’t be concerned. Like any natural hair, boar’s hair sheds (though much less than horse hair). Just rinse the stray hairs off. They won’t scratch. Did I mention that boar’s hair is gentle? Well, if you’ve ever pet a boar, you already know that! 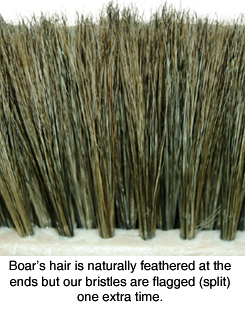 Unlike synthetic bristles that can rub your vehicle the wrong way, boar’s hair stays soft. It lightly massages the surface of the paint and, amazingly, it doesn’t fall limp when wet. No nylon or polyester fibers are used in this brush – its 100% boar’s hair! Each of the dense bundles of hair is permanently secured to a 12” molded plastic handle. The handle is comfortable to hold and easy to handle. Glide over glass, paint, and metal – the brush will not scratch! The Monana Original Boar’s Hair Brush provides ample room for dirt to move away from the paint surface, rather than being rubbed into it. Plus, a boar’s hair brush holds more soapy water than a mitt or even a nylon brush. Brush your baby clean with our 100% natural Montana Original Boar’s Hair Wash Brush! Detailing Tip: It's recommended you soak your boar's hair wash brush in soapy water for a few minutes before use to make the hairs softer and more pliable. This brush is reminiscent of the brushes my father used in the 60's and 70's. in my opinion it's still the best way to wash your vehicle. Just remember that gentle pressure is the key and use a wash that produces loads of suds! ConsThe handle should have a bumper around it. I received my brush OK. I'm sure it will give me years of good service as soon as the weather warms up enough to use it. I have used other brushes of this tipe and was very satisfied with them. I had been using a microfiber mitt to wash my Jaguar before car shows. The mitt worked fine but on cold days (I live in Iowa), keeping a cold wet mitt on continuously was not pleasant. Many years ago, I used a wash brush so I decided to give this one a try. It does a great job of removing dust and dirt from the Jag especially in the creases and seams without damaging the surface. For tough spots like bird droppings or tar, I need to augment the brush with a nylon scrubbing pad. The brush does leave some loose bristles on the car; however, they disappear with the rinse. ProsFast! I can cover the entire car faster than when using a washing mitt. Does not leave any swirl marks. Gets into joints, creases, seams, etc. ConsLeaves some bristles while washing; however, this is very minor as I rinse the car off before drying anyways. Works as advertised. Very minimal bristle loss very ergonomic. Much easier to use than a sponge or synthetic fiber wash mitt. We have a black BMW335 and an anthracite brown 911 and the bruch works great on them finish wise.